This Facebook group connects Camp Fire affected businesses with offers of support from businesses offering material and other assistance. Businesses in need and donors may join the group here or through the groups link on the Paradise Ridge Chamber of Commerce Facebook page. Please contact SBDC for any business assistance and information that you may need including FREE One-on-One Business Consulting Services. 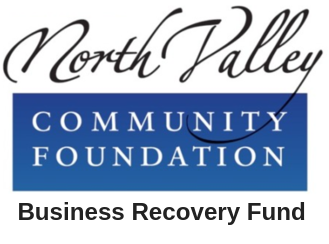 For businesses impacted by The Camp Fire, SBDC can assist you with accessing capital to rebuild your business, provide free one-on-one business consulting and trainings needed to survive through various stages of your business, and help you establish steps toward recovery. To register for trainings, please email, call (530) 895-9017, or log onto SBDC's website. Click here for resources and information. 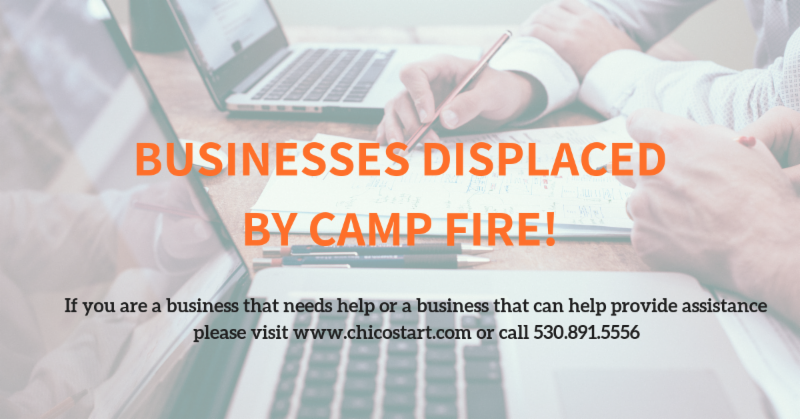 The Chico Chamber of Commerce and Chicostart have partnered together to help businesses displaced by the recent Camp Fire. If you are a displaced business that NEEDS assistance CLICK HERE. If you are a business that can HELP a displaced business CLICK HERE. SCORE counselors are ready to advise displaced businesses. For an appointment call 530.891.5556. Here's a comprehensive guide to state, federal and local assistance programs for financial assistance, taxes and property assessment, workforce and other aid. The Paradise Rotary Foundation's goal is to assist with businesses and organizations that will be participating in the reestablishment of our beloved town. Click the Paradise Rotary Foundation icon to apply. For more information, email the Paradise Rotary Foundation. The Business Recovery Fund will focus on the restart, recovery, resiliency and renewal of businesses and micro-enterprises in Paradise and the surrounding communities that serve as havens until Paradise is fully rebuilt. Fund uses will be determined by the Butte County/Town of Paradise Business Assistance Task Force and will include technical advice, micro-loans, micro-grants,credit enhancements, matching funds, workshops, relocation assistance, mentoring, infrastructure and any other means that will retain and expand business activity impacted by the Camp Fire. Click the image on the left for more information and automated donations. 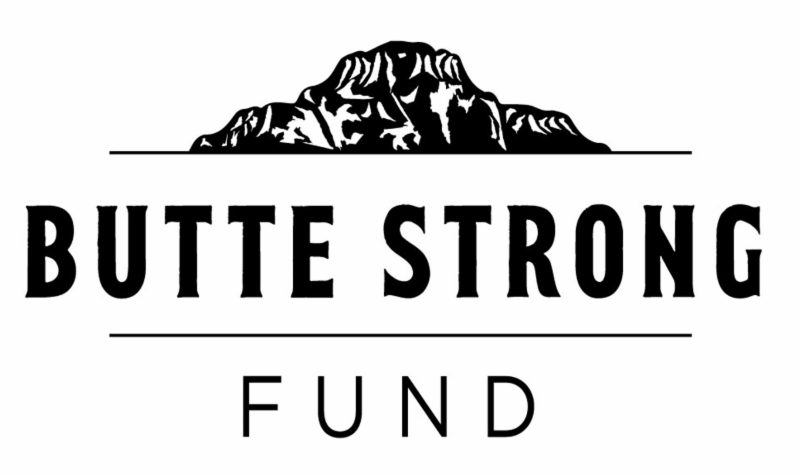 The Butte Strong Fund, a partnership of the North Valley Community Foundation, Sierra Nevada Brewing Co. and the Aaron Rodgers NorCal Fire Recovery Fund focusses on longer-term rebuilding. Small business owners are the heart of Butte County, and we need to get them back on their feet. Funding is available for Camp Fire affected businesses that have re-opened or are still deciding whether to re-open. Many of their customers and employees are displaced. To rebuild fully, communities will need to access additional financial support for not just months, but years. Knowing this, the Butte Strong Fund was set up with the specific intent to work alongside communities for up to three years after the fire. The goal of the 3CORE Campfire Relief Business Assistance Fund is to assist in reestablishing and supporting Paradise and Butte County business is affected by the Camp Fire disaster. Priority will be given to those businesses that have a continuing customer base and market share both inside and outside of the initial impact area. 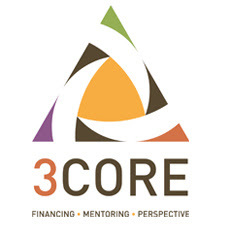 The 3CORE Campfire Relief Business Assistance Fund provides direct business loans.